Thanks for all of you who have answered the first poll of this blog, I never thought that some of you are actually interested in having more desserts (42%) on this blog, this will be taking in consideration. We have a tie for second, Italian and Asian food (35%). I have to admit that I don't have that much of these cuisine here. I'll put more for sure. As promised, here is an Asian dish. 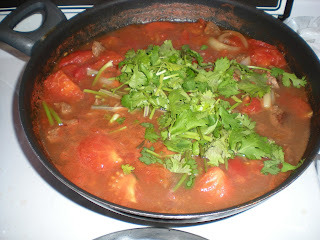 This recipe has been in our family for several years and we are still cooking it. One technique in Asian cuisine is through water evaporation in order to get the full flavour of your dish. This dish is very simple and easy to make. 1. Cut steaks into strips. 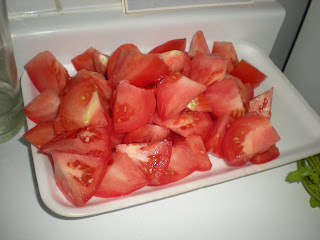 Cut tomatoes into 8 pieces. 2. In a wok or large pot, heat oil over medium-high heat. Cook steaks until it starts turning brown (still a little bloody) and onions until transparent. 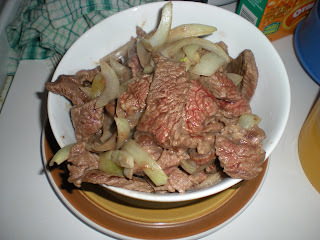 Remove steaks and onions out of the wok or pot. 3. 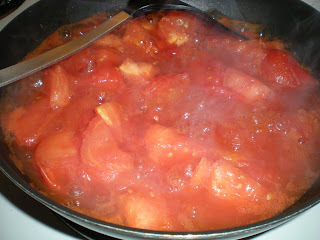 Add tomatoes, ginger and ketchup until the liquid becomes thicker, about 12 to 15 minutes. Stir time to time. Do not scoop out the water. Once the liquid thickens, throw in the beef. As the beef becomes entirely cooked, mix in sugar and salt. Serve immediately. Top it with coriander and serve with rice.